The winter issue of Canadian Quilter features an elegant, Poinsettia wreath wall hanging, Winter, designed by Canadian, Arlene Nicholas, of The Quilter’s Bouquet… your holiday decor will dazzle! 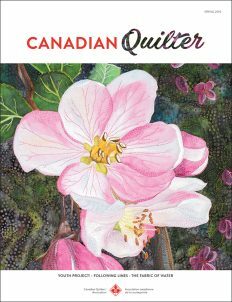 In addition, meet international quilter and 2019 Quilt Canada teacher, David Taylor, and Naoko Hirano, a Japanese CQA/ACC member, who visits Vancouver every summer. Both quilters share their colourful quilts and talk about perseverance toward excellence. Check out our new challenges–Member Guild Challenge and Suzi-Q Youth Challenge. Be inspired!